Prime Minister Sheikh Hasina called upon parents specially mothers to give attention to groom up their children as worthy citizens with the ideals of Begum Rokeya. “Especially the mothers should give attention to the children so that they don’t become bending to militancy, terrorism and drug,” she said while distributing Rokeya Padak-2018 at a function at Bangabandhu International Conference Center (BICC) in the capital on Sunday. “The parents have to build a friendly relation with their children so that they can share their happiness, sorrow and any feelings with them,” the prime minister said. State Minister for Women and Children Affairs Meher Afroz Chumki presided over the function held under the auspices of the Ministry of Women and Children Affairs marking the ‘Rokeya Dibosh’. This year, five prominent women of the country received the Begum Rokeya Award for their outstanding role in empowering womenfolk. They are – former state minister Jinatun Nesa Talukder, former teacher of Comilla Women College Prof. Zohara Anis, noted cultural and social worker of Sunamgonj district Shila Roy, noted writer and social worker Rama Chowdhury and writer and social worker of Brahmanbaria Rokeya Begum. Secretary of the ministry Nasima Begum gave welcome address while Zebunessa Talukder spoke on the occasion on behalf of the award recipients. Sheikh Hasina said people of this subcontinent was the pioneer to show ways to the world as far as women development issues are concerned despite having some narrowness and ignorance in a section of people. “Despite being the champion of democracy American people so far have no female president. On that point of view, she said, we are in a more advanced position,” she said. She particularly was pointing out women occupancy in the posts of prime minister, speaker, leader of the opposition and deputy leader in the parliament. “However, women must give opportunities to earn for her own as financial solvency is big issue for making a woman independent and have a position in the family and society,” she said. Pointing out the opportunities created by her government for women the prime minister said women are getting the benefits of those programs. Women must make sure the best utilization of the opportunities created for them, she said. “Nobody will leave you a position until you create your own position to get it,” the prime minister said adding women should be proactive to establish their rights in the society as well as maintain family peace. Appreciating the increasing participation and successes of women in various nation building activities the prime minister said women are showing their capacities in all national spheres ranging from administration, judiciary, and flight operation to sports, army and peacekeeping. The nation celebrates the Rekeya Dibosh on December 9 every year marking the birth anniversary of Begum Rokeya, a Bengali feminist thinker, writer, educationist, social activist widely regarded as the pioneer of women’s education in the Indian subcontinent during the time of the British rule. The government introduced the Rokeya Padak in 1995 which is conferred on five eminent women every year recognizing their pioneering contribution to empowering women and raising women’s issues in the society. “Begum Rokeya was the torchbearer of the pathway so far we have come across and she brought the women to the light from dark in an age when women particularly the muslim women were barred from even coming out of home,” the prime minister said. But, in contrary, Islam has given utmost safeguard to the rights of women unlike other religions. Bibi Khadiza was the woman and the first human being adopted Islam and showed ways to the mankind. Every man and woman had followed her to adopt Islam, Sheikh Hasina said. Congratulating the Rokeya Padak-2018 recipients the prime minister said they have played a very praiseworthy role for development of womenfolk as well as the society. The prime minister particularly recalled the role of her mother Fazilatun Nesa Mujib in the liberation of Bangladesh saying the great lady sacrificed her life for Bangabandhu and was a great inspiration for the Father of the Nation. Paying her rich tributes to Begum Rokeya the prime minister said, “We are moving on the path she had showed us. Once upon a time an oppressed woman in our society could not tell her saga even to family members in fear of alienation. “But, the time has changed and parents are really encouraged to send their daughters to school. Women are now efficiently performing in the judiciary, army, border guard and air force. The government has framed many laws to protect the rights of the women. We had to overcome many obstacles to come to this position,” she said. 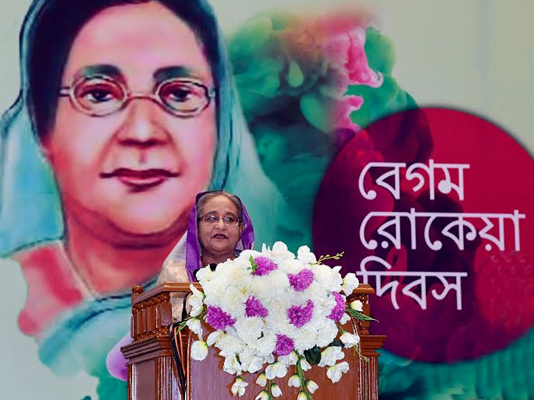 Sheikh Hasina said her government has made the female education up to higher secondary mostly free following the path of Bangabandhu who had created scope of education and job for women after liberation. Now female student can pursue education with government scholarship up to post graduate level, she said. The prime minister said maternity leave of women has been raised to six month and law has been made to include the name of mother along with paternal identity of a child.